Fredericton – Hundreds of people are expected to converge on the Fredericton campus of the University of New Brunswick this week as the annual Homecoming celebrations get underway. Homecoming 2016, running from Thursday, Sept. 29 to Sunday, Oct. 2, includes a wide array of events and celebrations, including a showcase of UNB research, a Homecoming football game, a family fun festival and a Saturday evening tasting event to name just a few. 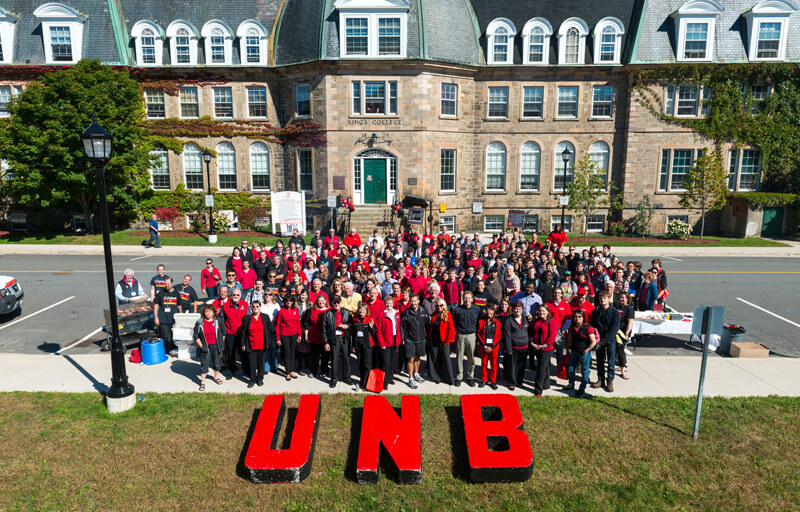 But while Homecoming is a big alumni event, it’s not only for people who attended UNB – it’s open to anyone in the community. Thursday, Sept. 29, 7:30 p.m. is Classes without Quizzes. Grab a front-row seat for this free event as UNB political scientist Don Wright tells us all about Clinton, Trump and the American Political Tradition. The lecture will take place in Tilley Hall 102, Alfred Bailey Auditorium. Friday, Sept. 30 at 1 p.m. is the UNB Research Showcase at the Student Union Building. The showcase is an opportunity to learn about some of the latest innovation and research happening at UNB and how it is affecting the world around us. At the showcase, we will have several top researchers on hand who will give insight into their work and how it makes a difference. This year, the showcase will spotlight three areas: UNB’s Andrew and Marjorie McCain Human Performance Laboratory – the mission of this state-of-the-art laboratory is to discover, disseminate, and apply knowledge in biomechanics and neuromuscular physiology of human movement; career development in international student families; the search for natural medicines. There will also be more than 30 poster presentations with research from dozens of disciplines. On Saturday, Oct. 1 at 10:30 a.m. in the Dineen Auditorium in Head Hall, a top expert on cybersecurity from the United Kingdom will take part in a session examining cyberthreats in the 21st century. Dermot Williams, CEO of the IT security firm Threatscape, will speak as part of the series entitled Cybersecurity in a Dangerous Time. He will also be speaking on starting, growing and selling your company. Also speaking will be Dr. Ali Ghorbani, Canada Research Chair in Cybersecurity and dean of the faculty of computer science at UNB; Sandy Bird, chief technology officer with IBM Security Systems and co-founder of Q1 Labs; Dr. Christian Couturier, senior executive partner with Gardner Inc.; a representative of CyberNB. At 1 p.m. Saturday in the Quad, the lawn next to the Student Union Building, is the Family Fun Fest, a chance for families to enjoy the UNB campus and experience an afternoon of fun and discovery. Also starting Saturday at 1 p.m. at the BMO field is the UNB Homecoming Football Game (tickets $5 each), featuring the UNB Red Bombers versus the Dalhousie Tigers. Wear your red and black and help us cheer on the home team. Lots of fun, excitement, food and prizes. And Saturday at 8 p.m. at the Student Union Building Atrium is the “Tasting” ($40 per person) – a truly red ‘n’ black experience as we sample an assortment of New Brunswick wines, beers and other fun drinks paired with some tasty appetizers. For more information, contact homecoming@unb.ca or 506-447-3218.